Discussion in 'Star Trek: The Next Generation' started by PicardSpeedo, Nov 4, 2018. 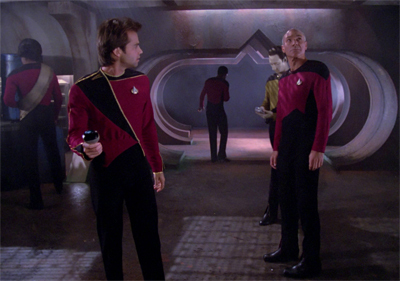 Like much of Blackman's work on TNG, Picard's Captain's jacket looks bulky and unseemly rather than sleek and stylish. I wouldn't be caught dead in that thing! At least Picard had the good sense not to have worn the jacket over jacket. It would have looked stupid if he had worn that captain's jacket over his standard uniform jacket. Lance and Armus like this. The best Captains Jacket was Sisko's unzipped standard uniform. olysounder89, Lance and Kilana2 like this. Are those images from DS9 "Rocks and Shoals"? IIRC, the entire (crash) landing party wore their jackets the same way, open in front, during combat. I wonder how many layers of shirts were worn under those jackets. He’s wearing four layers. Jacket, vest, shirt, and undershirt. No wonder he’s sweating. Lance and Tim Thomason like this. That’s all pretty silly IMHO. They should be wearing one layer of super-teflon that’s waterproof and doesn’t stain, maintains your inner temperature regardless of outside heat or cold, and that both won’t tear and can come apart (like Ro’s did) from a seamless opening in the front or in any segments you like, including bandages. All that, without even mentioning auto-camouflage, homing beacon, internal communicator, medical diagnostics, and SIRI. How many layers? The Sisko must have been boiling. Terok Nor and STEPhon IT like this. At least he didn't also have make-up and hair to deal with. Nakita Akita, Terok Nor and Armus like this. The part that gets ignored is the "piping" on the black shoulder area of the uniforms. I'm glad they were removed. I always wondered if this was done to show this is what is always worn for Starfleet. Side question though... I don't recall on ever seeing an early DS9/Voy uniform with a vest. Was it just the jacket and the longsleeve undershirt? Please, please, don't interrupt this thread with practicality. There was a skirt version. Uhura wears it in ST5 & 6. Sigh. I'll try this again with bold letters. The women versions was a strange fit and I couldn't understand why there wasn't a fit which would apply a skirt or short sleeves I might add. I believe so, just the turtle neck and the jumpsuit. Personally I think both versions of the DS9 uniform could have used a belt, and the visible seam zipper, like Admiral Ross's uniform. I still don't understand the distinction you're making, but it's probably my fault. I'm very sigh-worthy. It's not an outfit appropriate for a woman or a man IMO but for a skirt it should be either smaller in the mid-section and apply the dress jacket with a smaller or thinner belt so it would look... somewhat decent but I don't have clue why the heck the Hornblower-esque outfit was decided for the cast. How does a person breath wearing those impractical outfits, especially when overweight??? Well, hot yes, "boiling" might be an overstatement. The badges look a lot better on collars. I was thinking this same thing the last time I watched it, to be honest. The only part of the season 1 uniforms I liked more than the later ones was the pin-striping on top. I'm guilty of liking lots of pointless color lines on my clothing. As a youngster, I thought the collared uniforms were a big improvement. I remember how annoyed I was when the only Playmates actions figures I could find were the early season ones (“collars not stripes!” I’d always tell my mom when she was out shopping). Looking back, the men’s collared uniforms reflect too much of the oversized, unfitted baggy look of the 90s for my taste. Plus, I have a soft spot for first and second season TNG now, when it seemed like more of an adventure into the unknown, so there’s a pleasant nostalgia factor for those early uniforms. When GE made that robots commercial a few years ago, I was glad that they opted for early Data in spandex. Lance and Arpy like this. The admiral uniform that Jameson wore had a really nice look. It didn't have a collar, but it had that sash. I don't know if the sash was a separate accessory or if it was sewed onto the shirt. In any case, it was stylish. 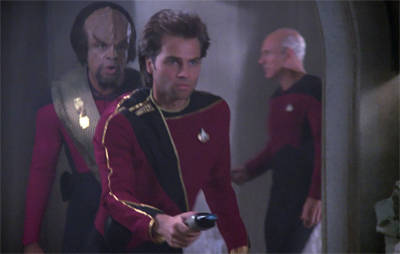 Btw, it looked so much better than Worf's tacky sash. The gold trims on the sleeves, at the edge of the sash, and that borders the black and red portions of the shirt were nice touches. Like the sash, they were not only decorative but gave the uniform the look of authority. PureCrimson and Lance like this. I like the TNG uniforms most of all Star trek uniforms. One coud really see which department the crewmembers belonged to. However the DS9 and Voyager uniforms were OK. But I've never understood why security had the same uniforms as engineering. Security should have been an own department with separate colors. Dark green or maybe violet or bright orange.